Last modified on Aug 19 2018. A WebDAV client for Windows OS. 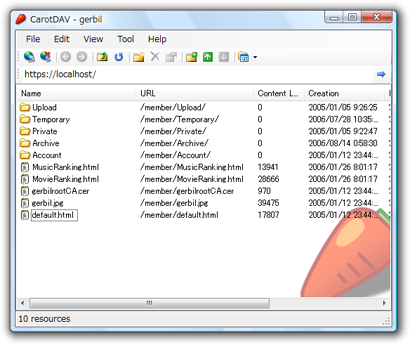 CarotDAV is a Simple WebDAV / FTP / SFTP / Online Storages client for Windows OS, available free of charge. In addition, simplified WebDAV server for local use are embedded. This software is free of charge. You can use it personally or commercially. You are also allowed to distribute secondary, fix/alter, do reverse-engineering. You can donate via BitCoin / gumroad / PayPal. You should take care of below from the point of security / privacy. By default, passwords are saved with no encryption. In the setting file, there are login IDs and raw passwords. By default, it is not encrypted. If you want to avoid risk, use master password. WebDAV server doesn't support user authentication or SSL/TLS. Since WebDAV server of CarotDAV is designed for local use, it becomes dangerous if the settings are wrong. Use loopback address(127.0.0.1) to prevent access from others. During OAuth procedure, CarotDAV shows the other site. Some services needs HTTPS server during OAuth. Since this site doesn't support HTTPS, CarotDAV use this page instead. I assure that site is safe in the same way as CarotDAV. CarotDAV accesses version file to confirm update on boot. Below informations are logged on the server at that time. Current version of CarotDAV you use. I keep these logs not to be seen from others as possible. I might use or public these information after statistical processing. I might show these logs to public institution if they claim. CarotDAV and I collect no other information.